I have been so busy lately… I just got a new job! I am still teaching middle school science but I switched the school where I am teaching. It’s only two blocks away from my house, so I really like the short walk in the morning. Moving in the middle of the year was pretty challenging and it kept me working late for a while. I had a lot of packing up, moving boxes, and setting up a new classroom. Right in the middle of this busy time, I started to not feel so well. Not sure if I was trying to do too much or if it is the crazy warm and cold January weather, but I was wiped out! When I don’t feel good, no matter how tired I am, I usually end up making a big healthy dose of chicken soup. Cut the celery into small pieces and slice the carrots into rounds and chop the onion and mince the garlic. Add the olive oil and vegetables to a pot heated over medium heat. Saute the vegetables until they begin to become soft and add the sliced mushrooms. Saute for about 5 minutes more until all the veggies are soft. Add the chicken stock and shredded chicken and bring to a boil. Add in the pasta and stir occasionally until the pasta has cooked (about 7 minutes). Chop the flat leaf parsley and add it to the soup. 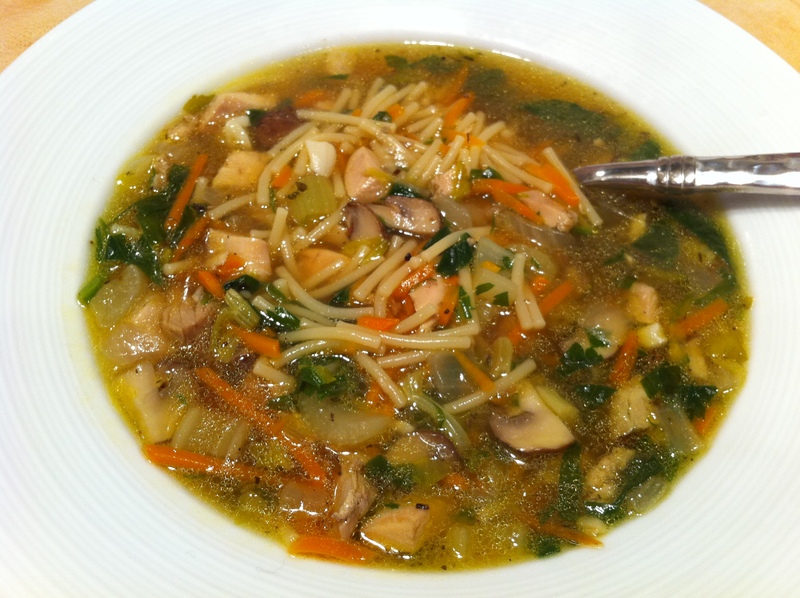 Sometimes, if I have it in the refrigerator, I like to add some fennel fronds to give the soup some extra flavor. 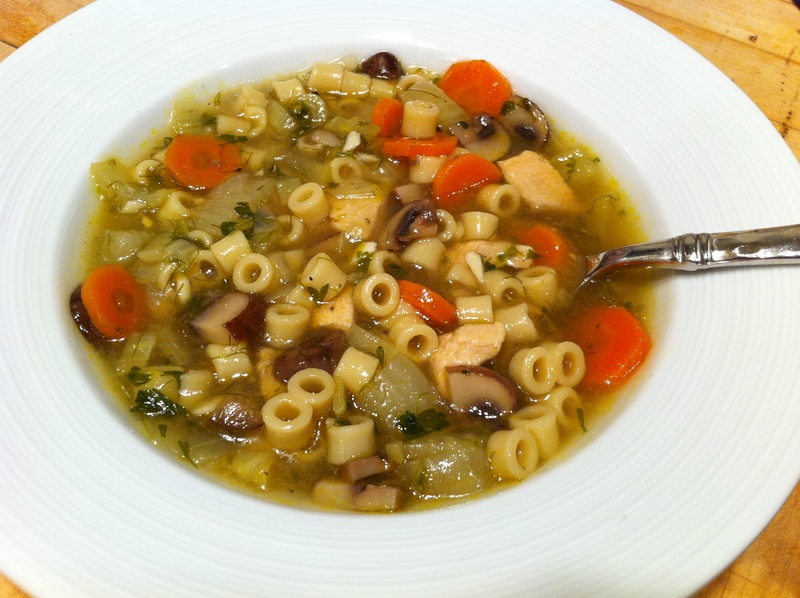 This soup is pretty quick and easy. You can make it in no time if you have everything on hand. Using the rotisserie chicken is a big time saver and it adds great flavor. I buy rotisserie chickens quite frequently because there are so many things you can make with them. I usually use part of the meat for a recipe that night and freeze the rest in 1 cup portions in zip-top bags. It thaws fast and it is really convenient if you are in a hurry. I’ll be adding more of my rotisserie chicken ideas this year! I feel lucky to have such a special group of friends. Made up holidays and events have become somewhat of a specialty among us. Many of our smaller parties have grown and become pretty large annual traditions. 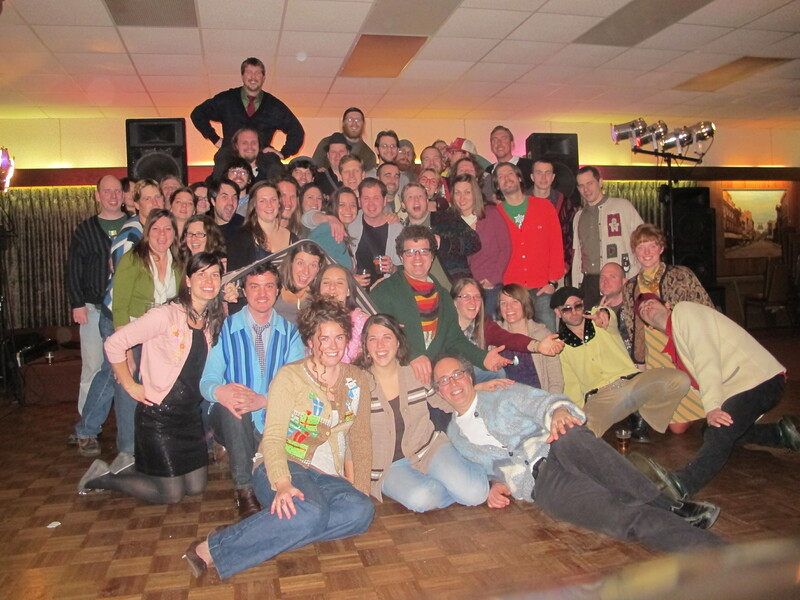 To kick off 2012, we celebrated Cardigan Christmas! Cardigan Christmas began in the small apartment of Matthew P. Johnson six years ago around holiday time. It was an opportunity for Chef Mark Lakin to fulfill his dream of cooking a Christmas turkey, along with all the fixin’s for a fabulous dinner. It was also an opportunity for all of us to sport our most snazziest of cardigans and celebrate the season with friends. That first Cardigan Christmas was a nice little gathering of close friends enjoying a comforting meal and listening to Matt roast us all in his Christmas prayer. Six years later, Cardigan Christmas has grown into a dinner so large that it is now held in the banquet room of the Dirty Ol’Tavern (remember that place from Guber Ball Day!). We celebrated and ate with 50 people! My hats off to Chef Lakin for preparing so much food. It’s not an easy task to cook that much turkey and then transport it to another venue. 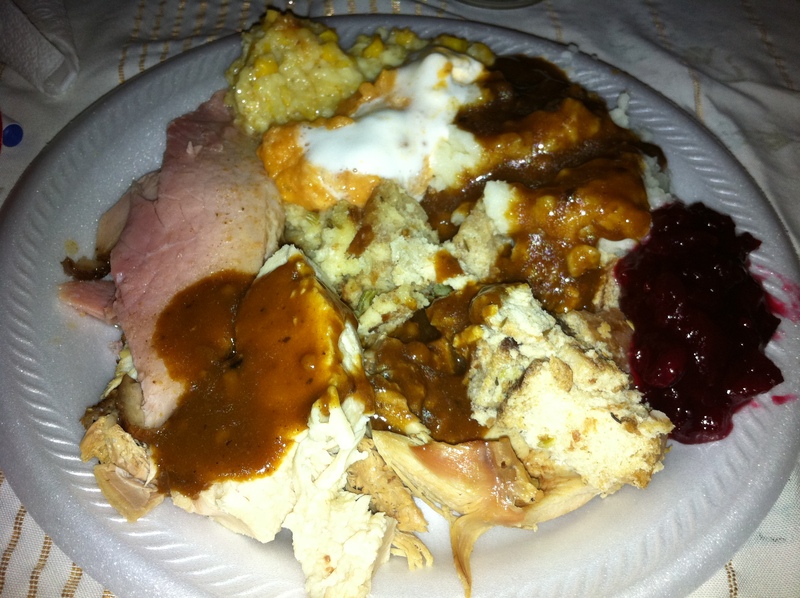 Turkey, mashed potatoes, stuffing, gravy, and sweet potatoes all made by Chef Lakin. Creamed corn made by Miss Kara. Ham baked by Miss Carrie. I made the cranberry sauce (recipe below). Peel 4 thick strips of zest from the tangerine with a vegetable peeler, being careful not to include the white pith. Slice the zest into small thin strips. Squeeze the juice from the tangerine and strain out any pits. Put the cranberries, zest, juice, and sugar into a small sauce pot. Heat over medium heat until the cranberries burst and the sauce thickens (about 20 minutes). Simple! I tripled it for the large crowd but this recipe makes a good amount for a smaller gathering. I also did a little baking for this event. I made two different types of cardamom cookies. I have never made cardamom cookies before but I always love getting them from one of the stands at central market with a cup of tea or coffee. The two recipes I tried were pretty simple but a little time-consuming. I really enjoyed the little sugar dusted cookie that this recipe made from Taste of Home. 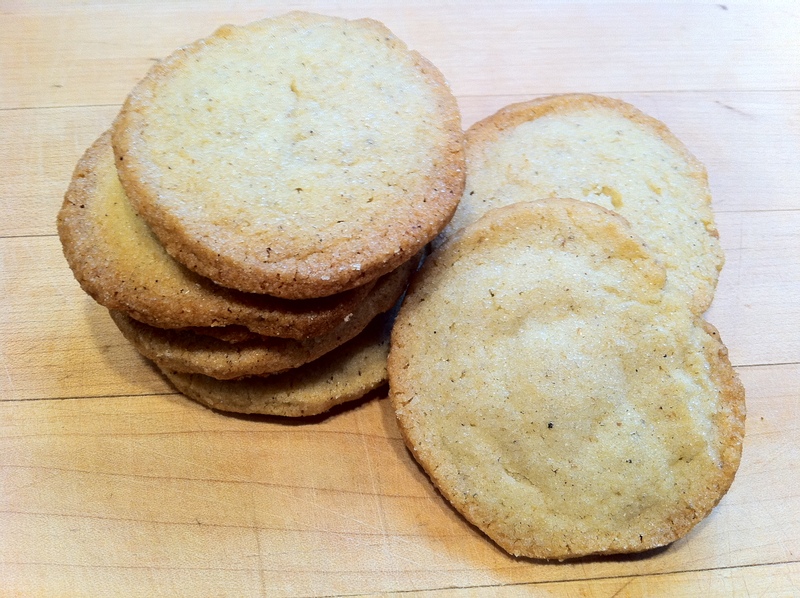 The other cookie was a cardamom shortbread that I found on the Food Network site (pictured below). We had an awesome time after our dinner. We worked off our turkey comas and danced to the tunes of Frankie Buttons and the Nitpickers. We even had post-cardigan snacks at our friend Evan’s house. What a fun evening! A very merry Cardigan Christmas to you!